With the economy suffering and folks losing their jobs, just about everyone is looking for money saving ideas. While hiking is just about free, there are costs associated with it -- most notably gas, bridge tolls, and day-use fees. So it makes good sense to consider each potential hike for recreation and monetary value. For example, I would think twice about making a day trip to Wilder Ranch. This state park just a bit north of Santa Cruz is about 120 miles round trip from San Francisco and the day use fee is a whooping $8 -- altogether too much money. Here are some budget ideas to ponder when you want to hike as inexpensively as possible. 1) Stay in the City. Two weeks out of the month, hike in town. 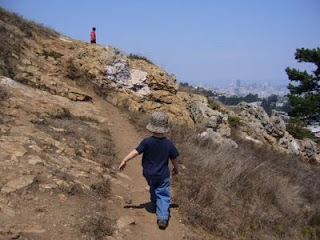 Mount Davidson, Lands End, and the Presidio are best bets for 2-3 mile hikes and you can reach all these trailheads by Muni or park for free at the trailheads. No, you won't have the same wilderness experience as Big Basin or Tomales Point, but you can hike some very pleasant easy trails without leaving town. 2) Take the bus. A round trip to Point Reyes from San Francisco via Golden Gate Transit and West Marin Stagecoach starts at $12. Or try a San Mateo County park accessible by bus such as San Pedro Valley Park. 3) Look for free trailheads. While I am a firm believer in always paying day use fees (our parks need the money), fees are often avoidable. At Mount Tamalpais, park for free at Mountain Home or Rock Spring instead of paying at Pantoll. You can park for free along the side of the road outside the parking lots at Samuel P. Taylor and Castle Rock. Just be sure to park legally and obey all posted requirements -- gamble for one of these premium parking spots by arriving as early as possible in the morning. 4) Go south and not very far. Bridge tolls make hiking trips north and east spendy. Instead, drive down the peninsula about 40 minutes to a free trailhead such as Purisima Creek Redwoods Open Space Preserve, Edgewood Park and Preserve, or Windy Hill Open Space Preserve. 5) Splurge occasionally. It's worth every penny to travel to Mount Diablo, Henry Coe, Castle Rock, and Sugarloaf. Consider car pooling with hiking buddies to save gas money and trailhead fees. 6) Get a parks pass. San Mateo County Parks pass is $60; California State Parks pass is $125. These passes are a big hunk of change, but use them regularly and save money in the long run. Consider asking for passes for birthday or holidays gifts. Hiking is still a great bargain. You don't need fancy clothes or even boots. Don't let a light wallet keep you from hitting the trail. 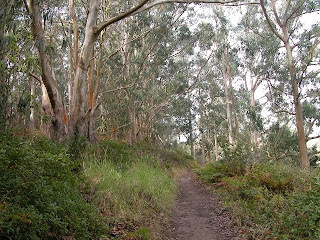 You might consider the Morgan Territory, it is free to enter and they have some nice hikes. Trails are well marked and dogs on leashes are allowed. Black Diamond Mines in Antioch is also a free destination with good hikes including a nice jaunt called the Prospect Tunnel loop.